An analysis of caviar samples from Bulgaria and Romania has revealed a high level of mis- or un-labelled caviar offered for sale. Researchers from Germany and Austria note that all sturgeon caviar containers must bear a label with a universal code providing information on its origin, including the sturgeon species, whether it is from farmed or wild fish and the country of origin. Real caviar is one of the most expensive animal products in world trade and is harvested from sturgeons and paddlefishes. 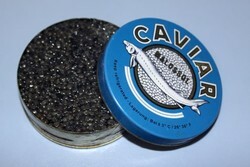 The price of caviar depends strongly on its species of origin with caviar from beluga sturgeon being the most expensive. Out of 27 samples tested, seven (26 per cent) were sold illegally in shops or by street vendors without labels on their containers, according to the scientists from the German Leibniz Institute for Zoo and Wildlife Research (IZW) and World Wildlife Foundation (WWF) Austria. All caviar samples were analysed genetically to identify the sturgeon species, and only 10 labelled tins or jars were in agreement with the species code on their label. Four samples were mis-labelled, containing caviar from another sturgeon species or more than one species. In at least one case the caviar was 'upgraded' from a lower-priced species to a more expensive one. Six samples were counterfeit and should not have been declared as caviar at all, according to the researchers. Three of these counterfeits were free from animal DNA and probably made entirely of artificial substances, while one was identified as a fish species called lumpsucker (Cyclopterus lumpus) whose eggs are commonly offered as caviar substitute. The other two counterfeits were most likely made of sturgeon meat. Four samples were of particular concern from a conservation standpoint, as they appeared to come from illegally caught beluga sturgeon (Huso huso), which is on the brink of extinction in areas such as the Danube River. "These samples were sold in restaurants or by street vendors explicitly as originating from wild Danube sturgeon, which were therefore illegally caught," said Arne Ludwig from the IZW. "An effective conservation of sturgeons can only be possible, if poaching and illegal trade are finally banned," echoed Jutta Jahrl from WWF Austria. Romania and Bulgaria are the only countries in the EU where viable populations of sturgeons can still be found in the wild, specifically in the Danube and Black Sea. Harald Rosenthal, President of the World Sturgeon Conservation Society (WSCS) said that while catch and trade bans have been established in both countries, illegal fishing obviously continues.